Three years ago I bought a 1999 Rolls Royce Silver Seraph for less than the difference between the trade-in value of my 65,000 mile Audi A5 3.0 quattro Sportback and a new one. I kept the A5 for everyday use and we have covered 12,000 glorious miles all over Europe in the Rolls Royce at an average on long runs of almost 20mpg, and that’s without hanging about. In that time it has been supported brilliantly by the local specialist from whom I bought it and who has serviced it continuously for more than 12 years: Silver Lady Services in Bournemouth is owned by an ex-Rolls Royce apprentice and his service is everything you might expect for the marque without hourly labour rates running into three figures. With little or no depreciation compared with a new car, it actually makes a lot of sense. As a result, we have come to love the Rolls Royce, as do friends and family who enjoy being taken to the airport, christenings etc. in style. We intend to keep it long-term but we have come up with a problem: The airbag light has come on, which, of course, is an MoT failure and the fault has been diagnosed as in the steering wheel. 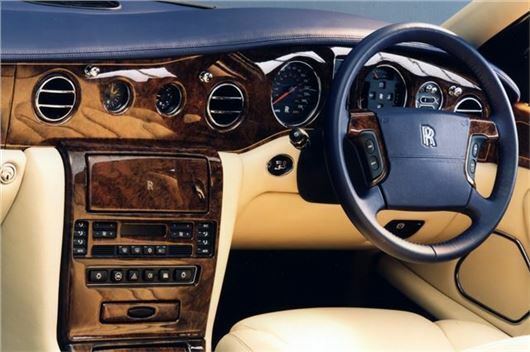 Unfortunately the official Rolls Royce/Bentley parts service say that a replacement airbag for the wheel is no longer available and the MoT is due in March. Is there a solution? The car has lots of BMW parts on it including the V12 engine. The airbag might be a component used in a BMW model, but which one? On a wider point: Surely critical parts that result in an MOT failure should be available for at least 20 years? I visited webuyabycar.com and it would not allow me to enter any car built before 2012. I have tried 3 times and then emailed them directly. They came back and asked for me to manually complete the form to buy the car, which I did immediately. This was a week ago. The advert on TV claims that cars are often bought within the hour. I await a call or email and as yet am pretty unimpressed with Mr. Scofield’s endorsement of them. It’s a pristine 1 owner 2010 Camaro with FSH and loaded: a desirable car for many people. Obviously not for them. It seems they are cherry-picking their cars. Cars bought by webuyanycar normally go straight into the UK Car section in British Car Auctions. Usually, if they don’t want a car, they simply make a derisory offer for it. In the case of an unusual car like this, rather the put it through auction, I think they will have been trying to get a price to place it in the trade. A short while ago, we were behind a car in a car park that started reversing rapidly towards us (the driver had noticed that a space was about to be vacated). My wife realised that the horn was required to prevent a prang. She only just managed to warn the approaching car in time, thanks mainly to the fact that modern car horns seem to require an inordinate amount of force to operate them. Why is this? Surely it’s dangerous to make this sometimes necessary warning so difficult. My parents’ MG 1300 back in the 1970s had a super little horn button on the end of a steering column stalk that could be operated with one finger. No weight lifting required. Probably to make it more difficult for people to use horns to admonish other drivers. The last time I really needed to use one was at 160mph on a two-lane autobahn, late for a plane, headlights blazing, when a truck stated overtaking a truck. No chance of braking at that speed. Happily the overtaking truck driver wasn't deaf. My young nephew owns a 2004 Mazda RX-8, mileage 49,000, in very good condition. However, due to changed circumstances that are unlikely to change back, the car hasn't been driven for eight months. Has it any potential as a collectors vehicle, or should he sell it, and if so what price range? Desirability depends if it’s the 190 5-speed or the 231 6-speed and whether the rotor rips are holding oil. Price range £500 - £4,000. I have owned three Honda Jazz, buying the first one on your advice in 2002. At this point in time I wish to change my current model but wondered if there is a better alternative in another make and model. Your advice would be very much appreciated. I have a 2003/53 LandRover Freelander TD4 SE Auto with 67k miles that runs well and is not causing any problems. Annual mileage around 6k, with trips to the 'tip', grandchildren and dog outings. Usually has a couple of annual runs with bikes on the back and golf clubs inside and I really like the 'cube' shaped loading area when the seats are down along with the best ever driving position for visibility. My wife's car is a 2012/62 Audi A1 1.6 TDI with 23k. This was bought new with longer journeys in mind (Edinburgh to London) 2 or 3 times a year to achieve comfort and economy at a reasonable price. As we all now know the DPF and emissions nonsense means this car needs to be driven at higher revs to keep the 'heat' up and the claim of 80mpg shrinks to more like 60 on a long run with the car proving to be just too small inside. We are looking to change and more than likely consolidate our needs with a ‘one car’ strategy. What should I be looking at with a likely spec of SUV, automatic and a size that my wife would not be tentative about using regularly? Toyota C-HR hybrid: /road-tests/toyota/toyota-c-hr-2016-road-test/ Or KIA Niro hybrid: /road-tests/kia/kia-niro-2016-road-test/ Or Honda HR-V: /road-tests/honda/honda-hr-v-2015-range-road-test/ Or SEAT Ateca. 1.5TSI manual fine, but if you want an auto it has to be the 2.0TSI to get a better transmission. I am considering purchase of a VW Golf Estate 1.4TSI SE Nav manual. Before going ahead, I wonder if you will be kind enough to advise if there is anything really negative about it, such as problems so far reported. Also, I have been offered the same with a 1.5 engine. Does it have a better reputation or is it just more powerful? We would be very grateful for you views before we undertake the purchase of our next, and probably last car, given our ages. For the time being we will retain my wife’s car, a petrol, manual VW EOS. So we really need another manual car, as I fear that driving a mix of manual and automatic transmissions on a regular basis is probably not a good idea. We cover around 8,000 miles each year. I have started to look at maybe a small SUV simply because of the ease of access/egress given our advancing years. Checking through your reviews of such vehicles does not produce a stand-out model, but the Mazda CX-3 looks a suitable candidate. We need 5 doors, 5 seats, petrol, manual, reliable, pleasant to drive and especially the gear change. We have always bought new or nearly new and kept the car for many years and don’t want to spend much more than £20,000 and preferably a little less. In your view is a small SUV a sensible choice, and which model do you rate the best in this category. Is there any other hatchback that we ought to consider? My daughter (with limited means) wants to purchase a 4x4 for towing a horsebox. She has found a 2013 VW Touareg at a garage in Hampshire with 94k on the clock, for sale at £14,995. Is this a reasonable deal? And what should I be looking for in the way of problems? It is a 3.0 litre diesel, so does it have cam belts, or chain driven? I have had a problem with the hood of my Alfa Spider not coming up fully. It has been with the main dealer for Nine weeks. (They damaged a part and had trouble getting a replacement.) They said a new pump might fix it (£1500 + fitting + VAT). This seems odd as the hydraulics move the hood down and most of the way to closure. They suggested I take it back the way it is and sell it for what we can get. I am not sure how much the car is worth as it has only 63,000 miles and I was offered £5,800 part-ex on a newer VW Polo, when the fault occurred. Can you please advise what action I should take or suggest a hood specialist in the North of England? My Google searches only yield replacement hood covers rather than the mechanisms. The biggest soft-top specialist in the country is Bristol Sunroofs: http://www.bristolsunroofs.co.uk/ I don't know anyone in the North of England, but there is a possibility that an innovative agricultural machinery repair shop can fix it because agricultural machines use similar hydraulics and electrical systems and these guys are used to adapting parts to make things work. I have a 17-year old Mercedes E320 diesel with low 42,000 miles. The previous owner was told that the Auto Box never needs an oil change and another person has told me that it does. I would welcome your advice, especially since you regularly advise annual engine oil changes. I've just received a renewal notice for the insurance on my wife's toy (a Colt CZC cabrio) with a price hike of 32% on last year’s premium. None of our insurance particulars have changed and the car is worth, probably, £1,000 less than last year. (Assuming I can find a partially sighted buyer who doesn't notice how ugly the thing is.) Is there any particular reason for such a large price hike this year? I am still enjoying your column on Saturdays, lots of reference to DSG gearboxes and emissions. It doesn’t look like VAG will get its come-uppance. My daughter’s Skoda was off the road for 10 days having the emissions fixed for the second time. Now seems to be ok. Not sure how long the DSG gearbox will last but the car is almost worth nothing now. I called in to my local BMW dealer (the group supplied my X5) and I asked for a price to change the oil. I was greeted with a very sarcastic comment “have you been reading Honest John?” They couldn’t give me a price so they picked one out of the air of £175, but I didn’t particularly like the dealership so didn’t bother. However, it has now come on the dashboard 'service in 3 months'. Should I book it in now early and at least it will get the oil change? The dealer has absolutely no interest at all in any vehicle lasting longer than 6 years, which is the limit of his legal liability. So what he wants is for major components like engines and transmissions to fail as soon as possible after 6 years, so the car has to be replaced and, even if it's not directly replaced with a new one, a new car has to be supplied to someone further up the line. I'd get the oil changed. BMW dealers charge anything up to £300 for an oil change, so £175 isn't so bad. Our Honda sets me back £50 a time for synthetic 5w/40 and a filter at our local lube shop in Nonthaburi. That could be a business idea. Get a Supreme Court ruling that manufacturers have to accept lube shop oil changes within warranty, then set up a chain of them. Could call it 'Luber Alles'. I own a 2004 Mercedes CLK 240 petrol cabriolet and my roof leaks when it rains. It manifests itself at the front of the drivers door: at the top where the roof joins the main body; just the right place to drip on the seat, or my arm when I drive. When this started last year I immediately took it to a specialised repair shop locally (Autotrim) and they told me it was most likely the contact points that needed cleaning. This they carried out but the roof has not improved since then. Apart from the astronomical cost of paying for a new roof, which would probably exceed the value of the car, have you any suggestions if the experts cannot fix it? I love the car and, although it has done 150k miles, I don’t want to get rid of it as it still looks brand new. I have had it serviced every 12 months/9,000 miles and always run on super unleaded. The problem is always the joins where the pillarless windows meet the roof. Especially the mechanism that drops the window to open the door, then raises it again to seal it. Have a look at the seals. Could be that smearing them with light silicone grease might be enough to stop the drips. This is an extremely complicated mohair roof. I know someone who has trouble with the same roof on a CLK when it was new. Replacing it could be a £4,000 job. I note your advice to avoid keyless entry and button start cars. I recently upgraded original BMW X1 to the latest X1 SUV. I find the lack of a key fob slot very disconcerting. So far I have walked away with the key fob in my pocket, leaving my wife driving off without. Luckily there was heavy traffic so I managed to run after her and rectify the problem. Not sure what would happened otherweise. I also parked and walked away from the car with the engine running a number of times: buying the morning paper, etc. And so far have not found a place to put the key apart from in the cupholder. My old car had a neat slot in the dash that also recharged the key fob battery. What, if any, are the imagined benefits of the so called upgrade? Glad you avoided a collision with the lorry but remember that if you are involved in an accident in Germany where you were travelling at more than 130 kmh, you will be held at least partially liable. 250 kmh on a two lane autobahn with other traffic might have been considered reckless. Hopefully it was just a typo on the letter/email to HJ about a reader trying to sell their Camaro through 'webuyabycar.com' rather than 'webuyanybycar.com' as per HJ's reply. I wouldn't advise putting 'webuyabycar.com' into your browser as mine says its a dodgy hyperlink. If this wasn't a typo, then this could be a phishing scam. If the driver was paying attention, then they'd have noticed an 'alarm bong' and notification on the iDrive screen as soon as you got out of the car, and the key left the perimeter of the car. Aw, webuyanycar didnt want to buy my camaro boo hoo! The customer’s email is missing quite a bit of detail and we wanted to advise you of this, so to avoid potentially misleading consumers in the future. Over the course of a month, 24th January – 23rd February, numerous emails were exchanged between the vendor XXXXXXXXXX and webuyanycar.com regarding the valuation of a 2010 Camaro. An initial response was provided by webuyanycar.com within 48 hours of Mr XXXXX’s first manual valuation enquiry and he completed and returned the forms we provided within five days. A further response was provided from webuyanycar.com within four days – so we are unsure as to why the consumer has claimed to have been ignored for over a week? Ultimately, the customer provided the necessary photographs we required on 14th February 2018 and a final manual valuation was provided the following business week, which was valid for 7 days – as all webuyanycar.com valuations are. The customer, presumably decided not to then sell via webuyanycar. I note how HJ rates the Mazda 2 very highly. My partner has a Mazda 2 90 bhp and really loves. She gets fantastic economy out of it - according to the onboard computer she has got in excess of 54 mpg over the last 2000 miles which is mostly local driving and in winter too. (Distance travelled in miles / fuel used in litres) x 4.546 UK gallons per litre = miles per gallon. The only 'error' will be in how accurate the odometer is, and is less so than using the car's trip computer, which uses a fuel flow meter to calculate the mpg (or equivalent, e.g. ltrs per 100km), which isn't that accurate in itself and has the error of the odometer as well. I suspect you'll find that your Mazda2 (presumably the 1.5 petrol rather than the diesel) probably does nearer to 50-52mpg - still none too shabby for a nippy 1.5 ltr petrol engine with a 0-60 time of 9.5 sec. My first car, a mid 90s Nissan Micra 1.0 (petrol) could 'only' do 52mpg with my 'light footed' driving style (I can get 40.5mpg in my Mazda3 mk1 1.6petrol), about 10% more than the advertised combined mpg. The 2 in 90hp form would suit me nicely if I don't need the boot space of the 3 any more and is far cheaper than the (still very good) CX-3, which is, in my view overpriced and thus sells in low numbers. At the risk of being labelled a complete anorak, I have a spreadsheet which I fill in every time I fuel the car, and it works out MPG over the last fill, last 10 fills, last 20 fills and over the entire life. It's useful to see any trend that might indicate a problem. Note that the odometer reading from the car may not be correct. In my last Hyundai, it under-read the true mileage by about 2.5%. I checked this on a long run on the M6, calibrating it against my sat-nav and the distance markers by the side of the carriageway. I too have a spreadsheet to work out my car's ongoing and historical mpg (since 2006). As regards the satnav being 'more accurate' - my argument from before stands - satnavs ONLY measure the distance as if it were looking on a map, so doesn't differentiate when you go up/downhill, which is often why you notice the 'speed' you are supposedly driving at shown on the satnav (normally lower than on the speedo) drop as you go up or down a hill, even if your actual speed remains constant. As such, DON'T ever rely on the satnav to just duck under the speed limit whilst passing a speed camera on a hill, especially a steep one. Of course, a small inaccuracy (under-estimation of distance) will also come from worn tyres, as the rolling circumfrence will be lower than when they had the full 7-8mm of tread on them. With regard to keyless entry, it's worth reminding readers that as well as keeping the key fob in a safe place, ideally out of range of isolated in a tin box, they also need to keep the spare fob in a similarly isolated location. Ideally a different place.